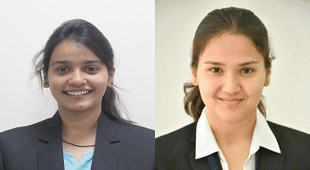 Ms.Harpreet Kaur and Ms.Deepaneeta Sarmah from Department of Pharmacology have been selected for IBRO-Young Investigator Training Programme(YITP ) .YITP comprises of a stay in Korean Neuroscience laboratories for training before attending the IBRO World Neuroscience Congress .It includes Roundtrip airfare (between the awardee's residing country to South Korea) ,Accommodationfees ,free registration to Congress and all miscellaneous expenses incurred towards the visit .Deepaneeta and Harpreet are among 57 around the world and 4 among India to be selected for this programme. Also, they are the only 2 candidates from the same Institute among various participants from Harvard ,Johns Hopkins ,Emory,Florey Institute ,Columbia Univ.etc.After the training programme they both will present their research at IBRO World Congress of Neuroscience in Korea .Here is the link for Awardee list. 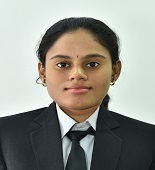 Ms.Kamisetty Leela Mounica M.S Student of Dep’t. Of Pharmacology and Toxicology was selected in IBRO-APRC Associate school at Indira Gandhi National Tribal University (IGNTU) 2019, Amarkantak (M.P.). Ms.Deepaneeta Sarmah Ph.D Research Scholar Phd scholar Dep’t. Of Pharmacology and Toxicology PhD scholar Deptt. of Pharmacology and Toxicology has been awarded with prestigious Raman-Charpak Fellowship awarded jointly by DST and CEFIPRA. She is among 25 awardees from India and among 5 in the category of Biological/Medical Science awardees. 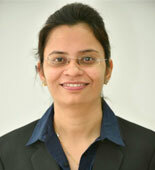 Ms. Deepaneeta will work on the collaborative PhD research project at INSERM France. Ph.D Student of Medical Device Department Mr. Namdev Moreunder the mentorship of Dr. Govinda Kapusetti and Dr. Akshay Srivastava won Best Poster Award in a poster presentation at ISNSCON 2018 6th World Congress on Nanomedical Sciences, held at Vigyan Bhawan, New Delhi, 7th - 9th January 2019. Title of his presentation was "Smart Piezoelectric polyvinylidene fluoride (PVDF) nanoparticle encapsulated poly (3-hydroxybutyrate-co-3 hydroxy valerate) electrospun scaffold for cartilage regeneration”. 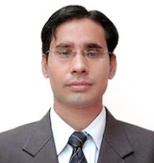 Mr. Nishant Sharma PhD scholar Dep’t. Of Pharmacology and Toxicology was selected in IBRO-APRCAssociate School on Neurological and Neuromuscular Disorders. 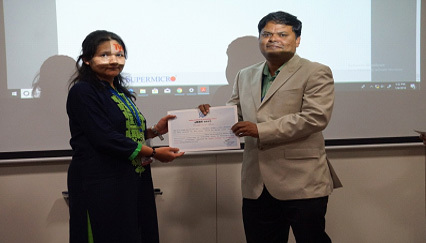 Nepal 2019.
International Traveling Grant: - Ms. Deepaneeta Sarmah Ph.D Research Scholar (Department of Pharmacology and Toxicology) Awarded with International Travel Support (ITS) SERB, Deptt. 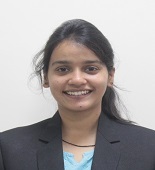 of Science and Technology (DST ) ,India Award to present her research at International Stroke Conference (ISC-2019) (American Heart/Stroke Association) at Hawaii ,USA. 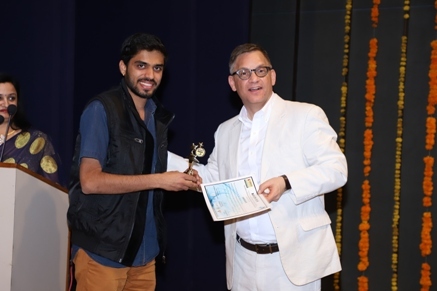 2nd prize award :- Team Plug-IN (Gopal Agarwal, Chintan Chaudhary, Mit Patel, Chanchal Gupta and KrishnaPriya S. (Mentors: Dr. Akshay Srivastava and Dr. Prasoon Kumar) won Second prize (Award money Rs. 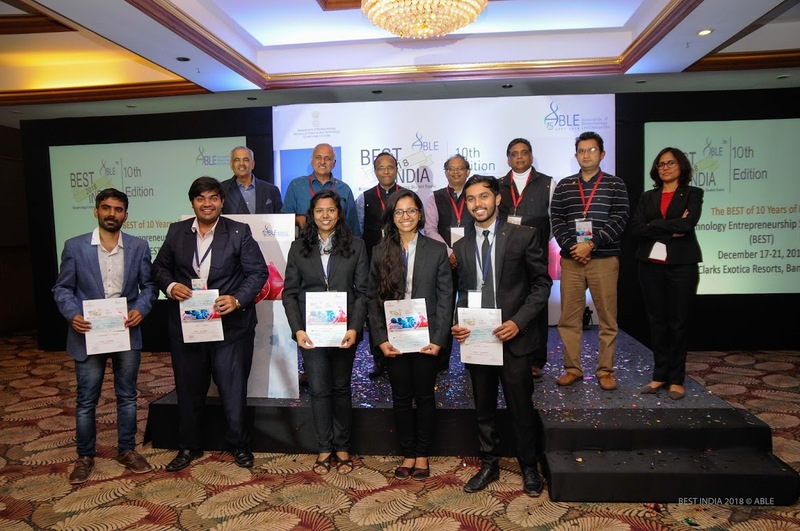 3 lakhs) at Biotechnology Entrepreneurship Student Teams (BEST-ABLE-2018) competition sponsored by the Department of Biotechnology, Government of India. 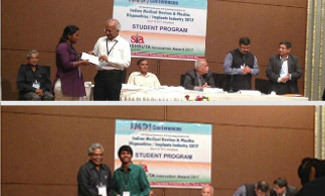 Student of Medical Device Department Mr. Mit Patel to our students has won first prize and Ms. Krishnapriya has won third prize in Shushruta Innovation award for poster presentation at Indian Medical Device Industry Conference (IMDI conference) 2018, held at AMA, Ahmedabad. Our Ph.D. Research Scholar Mr. Manish Kumar Sharma is working in the department of Pharmaceutical analysis has been selected among 15 young researchers by an evaluation board of science Slam World cup 2018which is going to held from 18th November to 25th November 2018. He will present his research work related to metabolite profiling of novel doping substance and his work broadcasting to an International and diverse audience .Many many congratulations to the entire team and department. Heartiest Congratulations to our students (Mr.Vignesh and Mr.Akshant) for their selection amongst top 50 students across India in Novartis Biotechnology Leadership Camp (BioCamp 2018), Hyderabad. Our Phd Research Scholar Miss. Harpreet Kaur working in the Department of Pharmacology and Toxicology has been for her selection in IBRO-APRC Neuroscience School 2018 at AIIMS, New Delhi. Many many congratulations to the entire team and department. NIPER-A Phd. 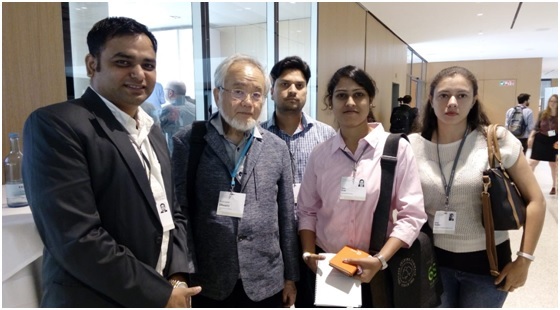 Student Dilip Sharma and Shreya Thakkar .invited for "The 68th Lindau Noble Laureate Meeting” Germany 2018 . Congratulations Jackson ! for published article in ACS Central Science. NIPER-A M.S student Mr. Jackson Saraf from the Department of Pharmacology and Toxicology under the mentorship of Dr.Pallab Bhattacharya has published article entitled: "A friend or foe: Calcineurin across the gamut of neurological disorders" in ACS Central Science (I.F 11.228) Authors: Saraf, Jackson ; Bhattacharya Pallab; Kalia, Kiran; Borah, Anupom; Sarmah, Deepaneeta ; Kaur , Harpreet ; Dave, Kunjan ; Yavagal, Dileep Corresponding Author: Dr.Pallab Bhattacharya.NIPER-A. 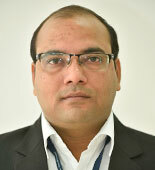 Dr. Amit Khairnar Asst. Professor, NIPER-A for getting awarded Ramalingaswamy Re-entry Fellowship 2018Dept. of Biotechnology (DBT) Ministry of Science & Technology Govt. of India. 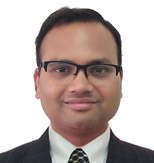 Dr.Pallab Bhattacharya has been awarded with WSC 2018 Young Investigator Award to participate in the 11th World Stroke Congress-2018 at Montreal, Canada .He is among the 34 winners from the world for this Award .His title of talk at the Congress will be ‘’Therapeutic implications of stem cell therapy in stroke: A move from bench to bedside” Congratulations! 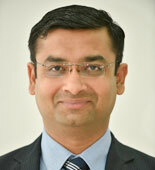 Dr. Dr.Pallab Bhatacharya, Asst. Professor, NIPER-A for Young Investigator Award. 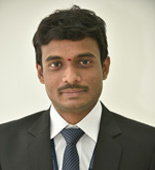 Dr. Dinesh Kumar Asst. Professor NIPER-A for getting awarded Ramanujan fellow 2018 Department of Science & Technology, Government of India. 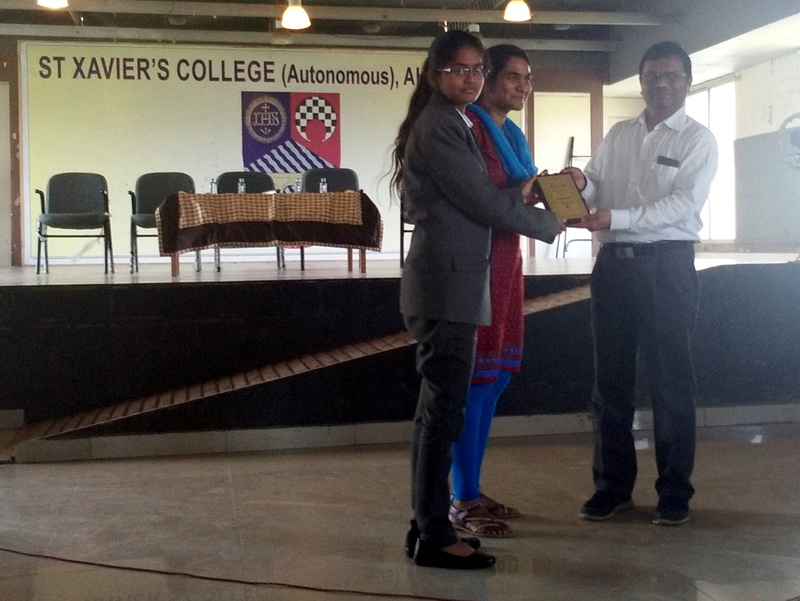 Our MS Students Anjali Arepalli from department of BIOTECHNOLOGY and KamarapuMounika from department of MEDICAL DEVICES Won 2nd Prize in BIOCALYX Quiz competition held at St.Xaviers college, Ahmedabad. Our PhD student Ms. Disha Thakkar won Best Poster Award at Applied Pharmaceutical Analysis-India 2018 conference, organized by Boston society. 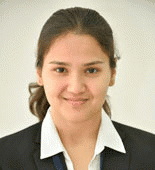 Disha is working in the department of Pharmaceutical Analysis under the mentorship of Dr. Abhijeet Kate. Title of her presentation was "In silico and in vitro metabolite identification and characterization of brexpiprazole by LC-QTOF mass spectrometry”. Our MS student Mr. Abhishek Kulkarni working in the department of Natural product has been awarded with Best Poster Award on his poster Presentation at an International conference titled "Innovation in Pharmaceutical Research by Interdisciplinary Approach” organized by Institute of Pharmacy, Nirma University. 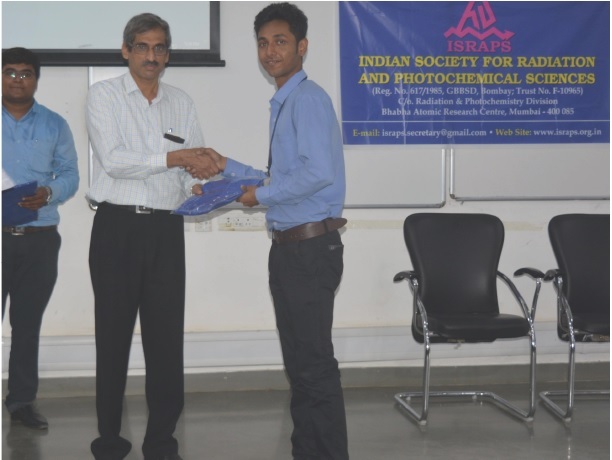 Title of his presentation was "In vitro Anti cancer Activity of Some Indian Medicinal Plants against Neuroblastoma”. Many many congratulations to the entire team and department. Namdev More from Dept. 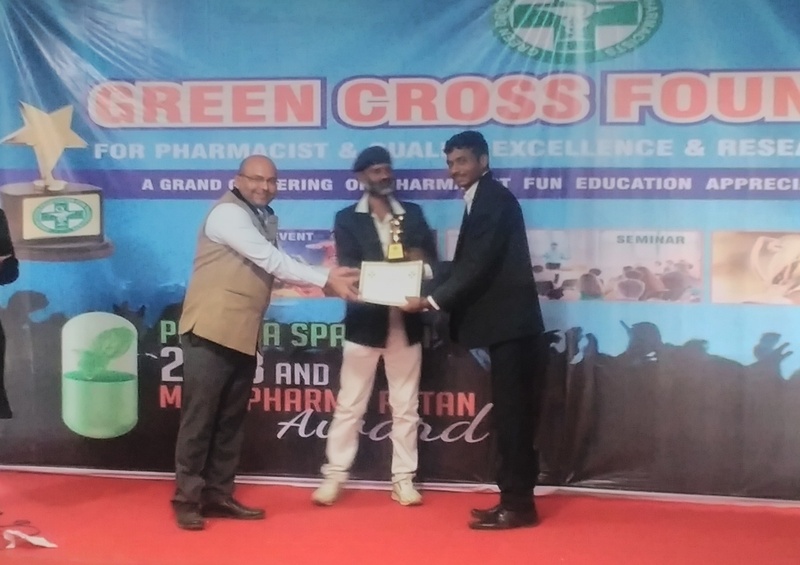 Of Medical Device Awarded as"Best pharmacist Award (student)" from Green cross Foundation Maharashtra. 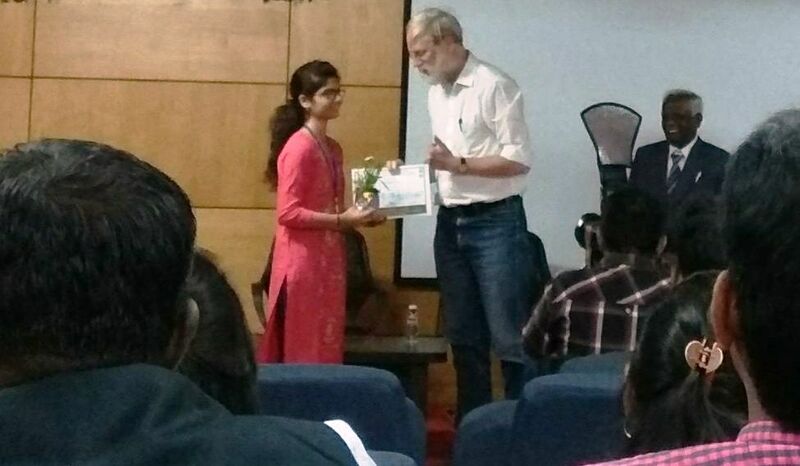 Pratiksha Kochar won Best Poster Award at IIT-Indore. 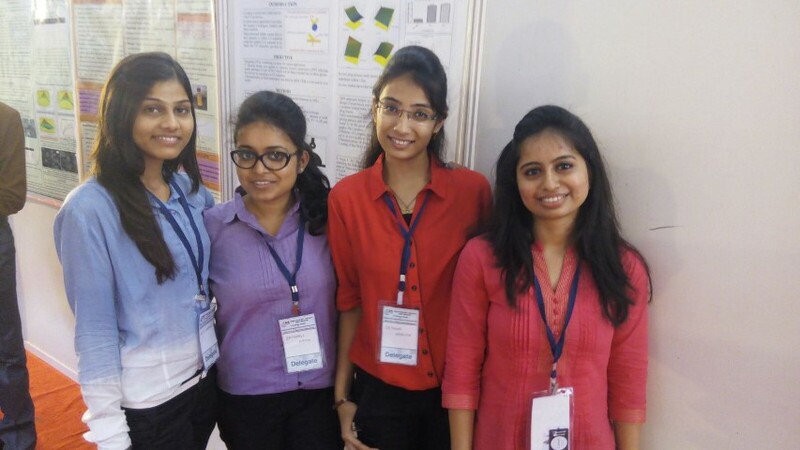 Pratiksha is working in the department of Pharmaceutics. She has been awarded with best poster award on her poster Presentation at an International conference titled "Emerging Areas in Biosciences and Biomedical Technologies (eBBT) 2018” held at IIT-Indore .Title of her presentation was "Exploring the potential of lipid vesicle based formulation for transfollicular drug delivery in androgenic alopecia treatment”. 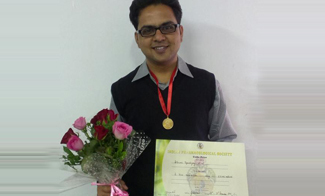 Anup Kumar won Best Poster Award at IIT-Indore. Anup is working in the department of Medical Device. 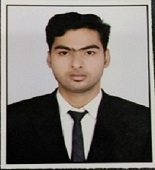 He has been awarded with best poster award on his poster Presentation at an International conference titled "Emerging Areas in Biosciences and Biomedical Technologies (eBBT) 2018” held at IIT-Indore .Title of his presentation was "Electrochemical biosensor based on nanocomposite for the detection of biomarkers of liver diseases". 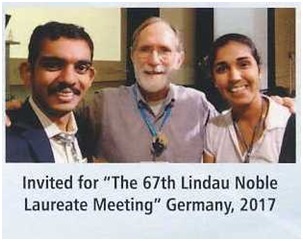 NIPER-A BT Student Ms. KRUSHALI POWALE Invited for "The 67th Lindau Noble Laureate Meeting” Germany 2017. 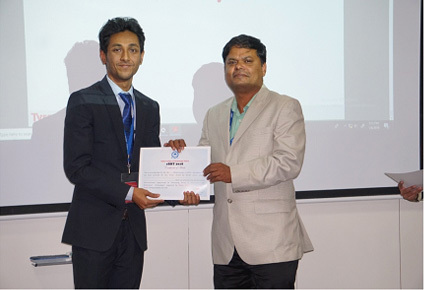 Mr. Aditya Guduru won 1st prize in poster presentation at IIT-Roorkee. Aditya is working in the department of Medical Device under the mentorship of Dr. Mukty Sinha. He has been awarded with 1st Prize on his poster Presentation at International conference on Nanotechnology : Idea, Innovations and Initiatives-2017 held at IIT- Roorkee. 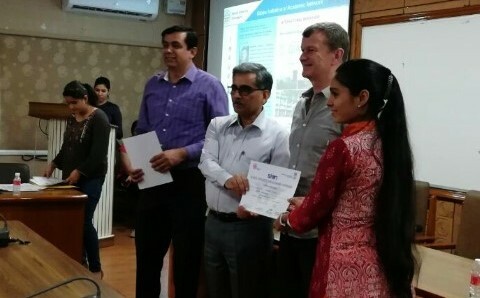 Ms. Heta Thakar won 2nd prize in poster presentation at International Conference on Nanotechnology Addressing the Convergence of Material Science, Biotechnology and Medical Science organized by Centre for Interdisciplinary Research, D. Y. Patil Education Society, Deemed University, Kohlapur. 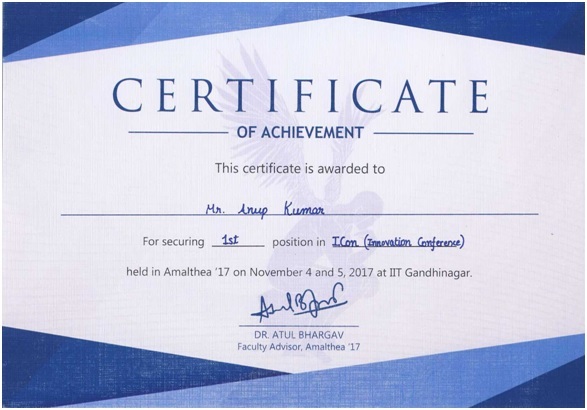 Our MS student Mr. Anup Kumar working in the department of Medical Device under the mentorship of Dr. Mukty Sinha has been awarded with 1st Prize on his poster Presentation at Innovation Conference(ICON) of AMALTHEA’17 held at IIT-Gandhinagar .Title of his presentation was "Nanocomposite based electrochemical biosensor for liver diseases". Many many congratulations to the entire team and department. MS student Ms. Shivani Vaidya working in the department of pharmacology and toxicology under the mentorship of Dr. Vinod Tiwari has been awarded with 1st Prize on her poster Presentation at International Brain Research Organization (IBRO) Symposium held at University Institute of Pharmaceutical Sciences (UIPS), Panjab University, Chandigarh. Title of her presentation was "Reward Circuitry Associated with Pain Relief and Addiction". Many many congratulations to the entire team and department. 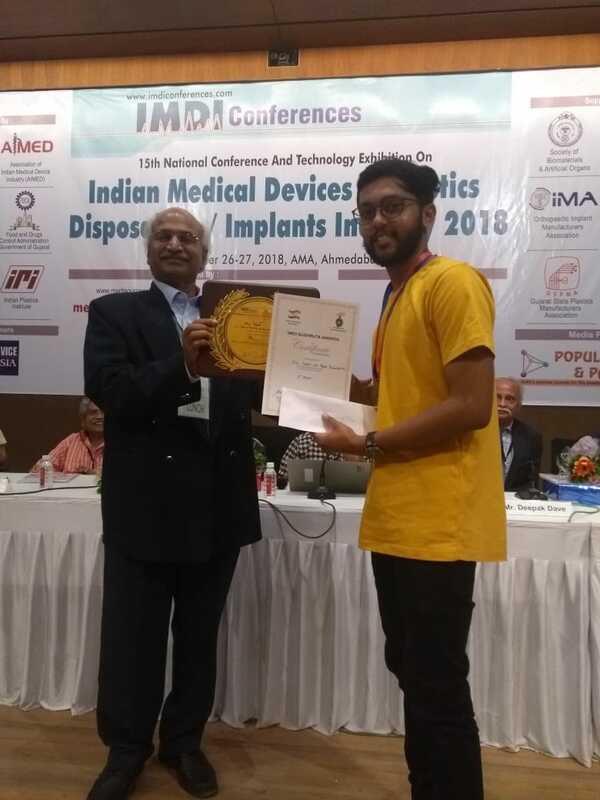 Congratulations !Poster presented by Anup Kumar student from Medical Device 2016-19 batch has been selected as one of the five best posters at the event held at IIT Gandhinagar. 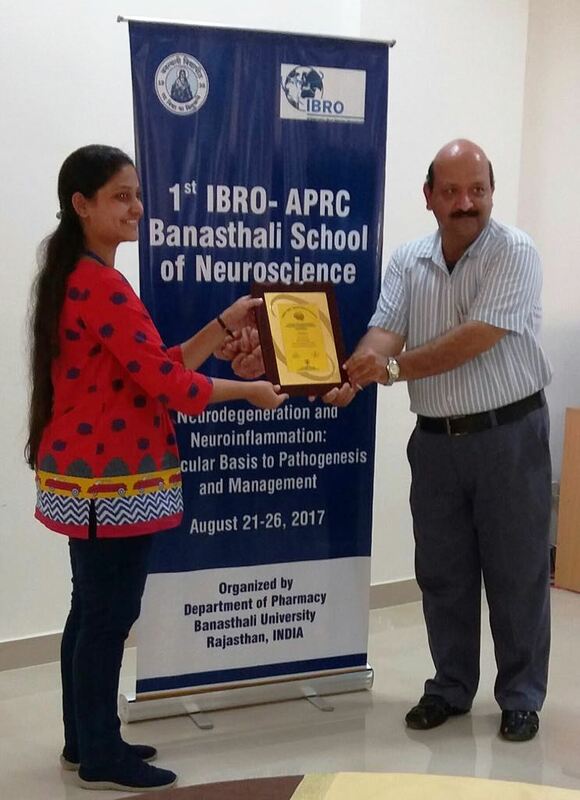 Ms. Pallavi Rane Pharmacology student from NIPER-A Batch 2015-17 Won 2nd Prize on her poster presentation at International Brain Research Organization, Jaipur. National level Quiz competition :Vedika Bhatt, Aishwarya Dasare, Neelam Chauhan. 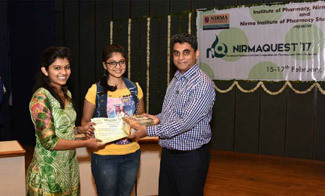 Awarded third Prize in National level Quiz competition at Nirma Quest, Ahmedabad in Feb 2017. 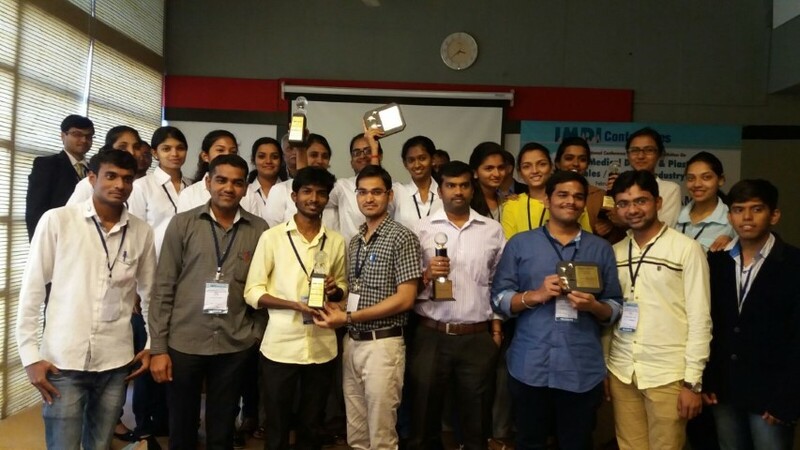 Mr. Namdev More and Ms. Mounika Choppadandi won best poster award for first runner up and second runner up, respectively from Department of Medical Devices in IMDI 2017 at Ahmedabad. Title :Electrospinning Piezoelectric Scaffold for Rapid Regeneration of Cartilage Arylic based vertebral bone cement detoxification by radical scavenging. 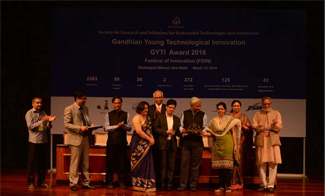 It is immense pleasure to announce that NIPER- Ahmeadbad team has been awarded prestigious "Gandhian Young Technology Innovation (GYTI) Award 2016" in Biomedical Engineering category and the award ceremony held on 13th March, 2016 in Rashtrapati Bhawan. All premier institutions of India like IITs, NITs, Central Universities and NIPERs etc. across INDIA has been participated for the award. All premier institutions of India like IITs, NITs, Central Universities and NIPERs etc. across INDIA has been participated for the award. GYTI 2016 was a PAN INDIA competition with over 2363 innovation entries in 50 technology domains from 276 Universities/Institutes belonging to 26 states & 2 Union territories. Four rounds of critical scrutiny with 125 members of high level evaluation team, 43 teams have been selected for innovation awards including all categories. Title: "Multimechanistic Polymer Based Novel Drug Eluting Stent Coating"
Ms. Nidhi Raval student of Department of Pharmaceutics presented poster entitled, "Comparative evaluation of chitosan vs bovine lipid based penetration enhancer for targeting drug to eye: in-vitro, ex-vivo study”She is conducting her dissertation under the supervision of Dr. Manju Misra faculty of Department of Pharmaceutics of NIPER-Ahmedabad. Ms. Baishali Nath student of Department of Pharmaceutics presented poster entitled, "Development and characterization of silica stabilized lipid based vesicular system for oral delivery of α-choriogonadotropin” She is conducting her dissertation under the supervision of Dr. Viral Shah faculty of Department of Pharmaceutics of NIPER-Ahmedabad. Mr. Dignesh Khunt Junior research fellow from Department of Pharmaceutics of NIPER-Ahmedabad presented poster entitled, "Formulation and evaluation of risperidone microemulsion based formulation for nasal to brain delivery: role of novel penetration enhancer” He is conducting this project under the supervision of Dr. Manju Misra faculty of Department of Pharmaceutics of NIPER-Ahmedabad. Ms. Amruta Jethwa student of Department of Pharmaceutics of NIPER-Ahmedabad presented poster entitled "Transcutaneous drug delivery of photoprotective agent”. Ms. Soni Ranjana from department of Natural Products from NIPER-Ahmedabad participated at 3rd International Congress of the society for Ethanopharmacology, India was held at Pt. Ravishankar Shukla University, Raipur India between 19-21st February 2016. The conference was entitled, "Ethnopharmacology & Evaluation of Medicinal Plants- Global Perspective”. Ms.Soni Ranjana gave oral presentation during one of the scientific session of this conference entitled, "Screening of Therapeutic Potential of Sargassum tenerrimum-A marine algae” She is conducting her dissertation under the supervision of Dr. Shankar Katekhaye faculty of Department of Natural Products from NIPER-Ahmedabad. 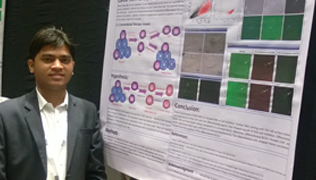 Dilawar Upadhyay research scholar from Department of Natural Products NIPER-Ahmedabad presented poster entitled, "Effect of thin film hydration and reverse phase evaporation method on physicochemical properties and storage stability of berberine liposomes” during 15th International CRS-IC Symposium 2016: "Advances in Technology and Business Potential of New Drug Delivery Systems” which was held at Institute of Chemical Technology Mumbai during 19–20 February 2016. 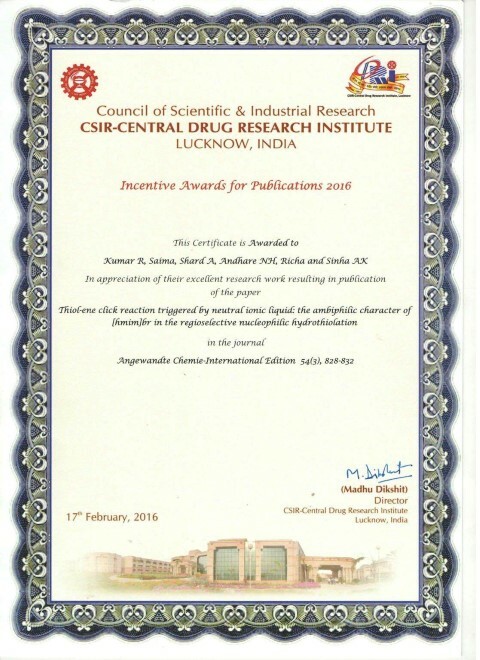 NIPER Ahmedabad faculty Dr. Amit Sharad received CDRI incentive award 2016 for publishing an article in Angewandte Chemie- International Edition 54(3), 828-832. 6th International Translational Cancer Research Conference – Prevention and Treatment of Cancer: Hypes and Hopes” held during February 04-07, 2016 at Hyatt Regency, Ahmedabad, Gujarat, INDIA. All the MS students, research scholars and faculty from Department of Biotechnology of NIPER-A participated and presented their research work during the conference. Prof. Kiran Kalia Director NIPER-A was invited to deliver talk during conference about "Oral cancer: The blazing dilemma for the tobacco-addicted Indian Inhabitants”. Dr. Neelam Chuhan faculty of Department of Biotechnology gave talk during the conference on the topic entitled, "Differentiation of cancer stem cells in conjugation with conventional therapy: A combinatorial approach for preventing cancer relapse’. Mr. Mansuri Akil M. MS student from Department of Biotechnology from NIPER-A presented poster entitled, "Prevention of cancer relapse: Conversion of cancer stem cells into terminally differentiated cells”. Poster presented by Mr.Mansuri Akil M and team during the conference won the award for outstanding poster during the conference. Mr. Maitray B. Raval. MS student from Department of Biotechnology from NIPER-A presented poster entitled, "Elimination of cancer stem cells through differentiation with simple therapy”. Department of Medical Device of NIPER-A has participated at National Conference and Technology Exhibition on 'Indian Medical Devices & Plastics Disposables/Implants Industry 2016'held at AMA on 12-13thFebruary, 2016, in Ahmadabad. Prof. Dr. Kiran Kalia Director NIPER-A delivered talk on "Changing Medical Device Industry Scenario in Gujarat” during the scientific sessions of this conference. "Osteoconductive PCL-Bioglass Composite Scaffold for Bone Tissue Engineering" by Jaicy Jacob et al. 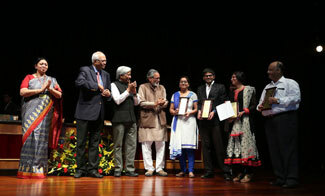 Gandhian Young Technological Innovation Award : Rashmi Jain, Vivek Makwana, Manish Nivsarkar, Amita Joshi. Targeting Lymphatics To Treat HIV Using Lipid Based Formulations. 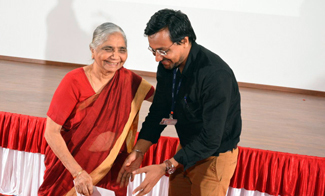 Gandhian Young Technological Innovation Award, 17thJanuary,2015. Gufic prize : Dilawar Uphadhayay, Sheetal Anandjiwala, Harish Padh, Manish Nivsarkar. In-vivo pharmacokinetic and metabolism of Picroside I and II from Kutkin in rat plasma. Indian pharmacological society conference 28-30 December,2014. Best Poster Award : Bhavik Kansara, Anita Mahapatra, Y. Venkat Raju, Lakshmi S. Glucose uptake activation in muscle cell line (C2C12) by Cassia auriculata. National conference on Herbal drugs: opportunities and challenges 5-7 November,2014.